Training Unit at Training Center Cape May, N.J., cradle the American flag and Gordon Huggins’ remains during a memorial service at Barbey Maritime Center in Astoria, Ore., March 30, 2019. ASTORIA, Ore. — The Coast Guard rendered military honors during a memorial service for Gordon Huggins held at the Barbey Maritime Center in Astoria, Oregon , Saturday. The service was lead by members from various veterans organizations that Huggins was a member. An honor guard from Coast Guard Station Cape Disappointment performed traditional ceremonial honors such as folding the American flag, had a bugler played taps and a 3-round volley was fired. Coast Guard members from other local units came to the service to pay respect as well. Gordon Huggins served in the Coast Guard for nearly 10 years and left as a Petty Officer 1st Class Engineman. He served overseas with Flotilla 1 on an 82-foot patrol boat during the Vietnam War and was awarded the Silver Lifesaving Medal as the sole survivor of the ill-fated Coast Guard 52-foot Motor Lifeboat Triumph. 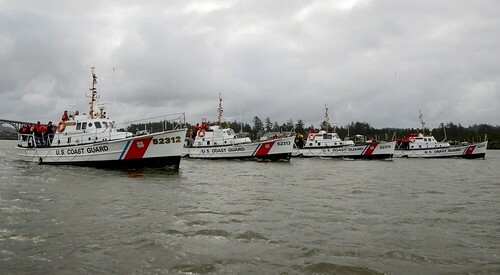 On January 12, 1961, while stationed at Point Adams Life Boat Station in Hammond, Oregon, Huggins was a apart of the Triumph boat crew that got underway for the difficult multi-Coast Guard-vessel rescue effort for the crew of the fishing vessel Mermaid that was in distress on the Columbia River near Peacock Spit. The seas were high and the Coast Guard rescue vessels had difficulty securing the Mermaid as the heavy breakers snapped the tow lines multiple times. The rough conditions ultimately caused the Mermaid to sink which capsized the Triumph. Additional Coast Guard vessels and aircraft were deployed to the scene to search for survivors, as well as foot patrols along the beach where Huggins was found alive. The other five members of the Triumph boat crew and two fisherman from the Mermaid drowned. After his Coast Guard service, Huggins retired after 22 years as a deputy sheriff with the Clark County Sheriff’s Office and was a member of multiple veterans organizations. He married Patty and together had two daughters Debbie and Brenda, grandchildren, great-grandchildren. His service dog Hoss has now retired in Huggins’ home.